You probably were not fed kiwi fruit when you were a child because it wasn't available. Kiwi fruit originates from China but comes to us from New Zealand. It is quite delicious when ripe and a good size and consistency for baby. Don't worry about the small seeds in the fruit. The seeds are too small for your baby to choke on them. They are another great finger food, and soft enough for babies without many teeth. Kiwi fruit are picked before they are ripe, so you will probably find them to be fairly hard. You should wait until they are a little soft before cutting open. They will ripen well on the counter. It can be difficult to cut up a kiwi because you feel like you are losing all of its fruit to the tough skin you must cut off. Just use a sharp knife and cut away. Serve in size appropriate for baby. 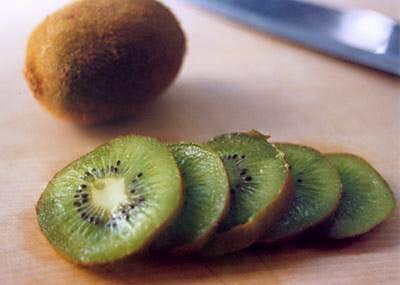 Ripen on counter and then store soft kiwi in the fridge until you are ready to use. Kiwi fruit have tough skins, so pesticide residue is probably not a problem here. Just toss them in fruit salad - mix them up with the blueberries that you will buy this week and add some yogurt and honey..
Blueberries are one of those miracle foods that doctors love. They are packed with antioxidants and low in calories. Be aware that small round objects can be choking hazards, so be careful when feeding blueberries to your baby. If they are large, go ahead and cut them in half. If your baby eats too many blueberries, they might develop a case of the "runs". Just be sure to cut him off if his poop starts to smell too much like blueberry pie. When is my baby ready? You can buy fresh blueberries or frozen. 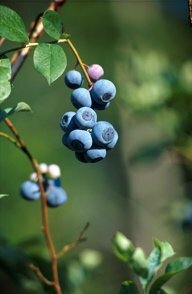 If you can find "wild" blueberries they would probably be the best for your child. 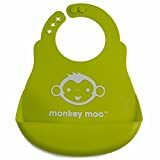 Just wash and cut up into small bits so there is no chance of baby choking. Fresh blueberries will keep in your fridge for a week. No, blueberries were found by the USDA to contain very little pesticide residue. This could be a starter for a meal, or a dessert, or just a fun thing to try. There is no reason baby can't sample some of this too. It incorporates plain yogurt, which you are probably still serving to baby. This recipe is adapted from Mark Bittman's "How to Cook Everything". Mix blueberries, water, cinnamon and sugar in sauce pan and cook at medium heat until blueberries fall apart (about 10 minutes). Puree mixture in blender and add yogurt. Serve cold with yogurt as garnish. Feed your baby and yourself the good stuff. On average Americans only spend 11% of their income on food. Don't be afraid to treat yourself to $6 per pound peaches if they look and smell great. Remember a scone can cost $2 too - and is not nearly as good for you.